We were admiring this dessert from Caviar Russe in New York City. It’s art on a plate. Then we realized: This is relatively easy to put together. We love artistic food, so we set out to make our version of this cake-and-ice cream dessert. If you buy the loaf cake instead of baking it, the only time-consuming parts are making mini meringues and cream cheese frosting. You can combine any flavors, use fruit purée instead of frosting, and add your own signature garnishes. To save time, we purchased a dense carrot cake—the same type used by Caviar Russe. Instead of cutting a square-ish slice, cut something more stylish, like the slim rectangle in photo #1. Don’t worry about “wasted” cake trimmings. In our book, cake is never wasted. At the least, you can toss it into the freezer to serve later, with a bowl of ice cream or an ad hoc trifle. It’s easier to pipe meringue cookies, especially the mini meringues used in this recipe. There are three on the plate. 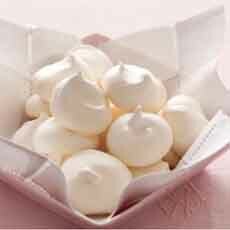 You can buy them from Miss Meringue, although homemade meringues, without preservatives, taste better. Here’s the recipe for the mini meringues in photo #3. You may also know a local bakery that sells them. Whatever you choose, make them all one color. Different colors are distracting on an already-diverse plate. You’ll note that there’s a dab of something white on the top right of the carrot cake. That’s crème fraîche, not a meringue. While we love it, we omitted it. There’s enough going on. These serve as a bed for the scoop of ice cream (top left of cake), and are a crunchy textural addition. We bought, instead of baked, the cookies; and chose oatmeal cookies for their homey flavor pairing with carrot cake (we bought cookies without raisins, for ease in crumbling). Use the cookies of your choice, from chocolate wafers to shortbread. It’s all about flavor pairing. 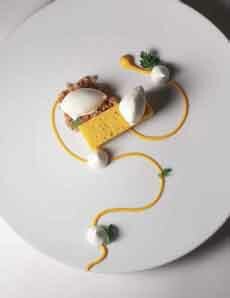 Simple ingredients like carrot cake are put together to look spectacular: a work of art from Caviar Russe. Mini meringues colored in pastels. Here’s the recipe from Taste | Australia. Vanilla goes best with carrot cake (or rum raisin, if you can find it). But expand your horizons with other pairings: coffee or strawberry ice cream with chocolate cake, for example. You can create your swirl from fruit purée or frosting. Since we chose carrot cake, we used cream cheese frosting, which also holds its shape better then purée. We added lemon zest and yellow food color, and copied the swirl pattern in the photo. If you like canned frosting, you can buy it and add the zest and color. Lastly, a color counterpoint to perk up the plate. Caviar Russe used herb fronds (the spots of green), but we didn’t want anything on the plate that people wouldn’t eat. We like mint with chocolate and other flavors, for example, but we didn’t want it as an edible with carrot cake. So we bought pomegranate arils, and they looked great. We could have used raspberries (or pastel candy lentils), but wanted a more delicate touch. 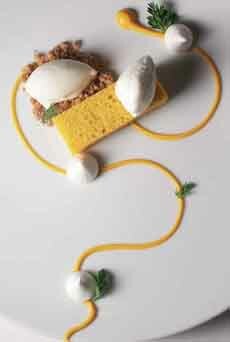 That’s our version of this artistic dessert. Now it’s your turn! 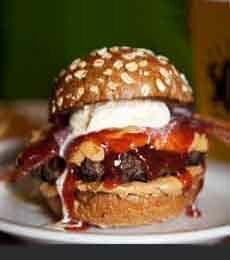 A PB&J Burger with vanilla ice cream. It’s a popular menu item with both children and adults (photo courtesy Slater’s 50/50). If you’re a burger person and an adventurous eater, here’s an idea from Slater’s 50/50, a burger gastropub with locations in Southern California, Honolulu, Las Vegas and Dallas. The restaurant is known for its signature burger, a 50/50 burger patty with equal parts of ground beef and ground bacon. To us, that sounds good enough to book a trip to the nearest location. A scoop of vanilla ice cream! To us, most of it makes sense. Peanut butter is the main ingredient in Thai peanut sauce, a condiment served with meat. Strawberry jelly’s sweetness is not too unlike a sweet BBQ sauce. But the vanilla ice cream? Well, we do enjoy an ice cream sandwich made of vanilla ice cream on raisin bread toast, and we’ve also made it on chocolate chip bread and a brioche bun. PB & Jealousy’s honey wheat buns have a similar sweetness. We look forward to trying it at home—perhaps a taste-off with a beef burger, a turkey burger and a veggie burger. And how about blue cheese ice cream or cheddar ice cream instead of the vanilla? Thanks to Flavor & The Menu for this story. 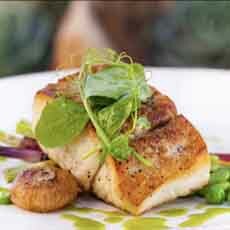 It was inspired by this dish from Bluewater Grill, with several locations in California and one in Phoenix. Their chefs know that serving multiple items generates more excitement. That’s why buffets are so popular. Just a bit of planning enables you to easily pair your protein with two cooked vegetables, a raw vegetable, and a grain or legume/pulse (the difference is below). Grains red quinoa in the photo (or rice, especially whole grain; (wheatberries, etc. ; vary with other starches like noodles and potatoes). Legumes or pulses (see the list below). Raw vegetables as garnish (shaved fennel with fresh dill [photo #1], carrot curls, diced tomato, radicchio julienne, red bell pepper dice, etc.). Or, add a fourth item on the side, such as halved/marinated cherry tomatoes or crudités. Whatever you choose, try to add color. No sauce is needed, but you can swirl balsamic glaze [photo #1], or dot the plate with pesto, flavored olive oil (basil oil in photo #2) or red bell pepper purée. Voilá, a healthful, colorful dinner. After the main course, as the French do. You can add an ounce of cheese to the plate, as the French do, too. Both legumes and pulses are the edible seeds of plants in the pea family (Leguminosae), a class of vegetables that includes beans, peas and lentils. Pulses are a subcategory of legumes. The difference is that legumes are sold fresh, and pulses are grown and harvested to be sold dried. The same product can be sold fresh (legume) or dried (pulse). The term “legume” refers to any plant whose fruit is enclosed in a pod. Legumes are a vast family of plants: more than 600 genera and 13,000 species (including chickpeas, peanuts and soybeans. 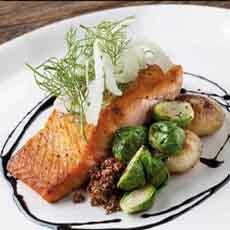 Salmon with red quinoa, Brussels sprouts and cipollini onions, topped with shaved fennel and dill. Salmon with a different set of garnishes: purple asparagus, spring peas, cipollini onions, topped with lightly dressed pea leaves and shoots, plus droplets of basil olive oil (photos #1 and #2 courtesy Bluewater Grill). 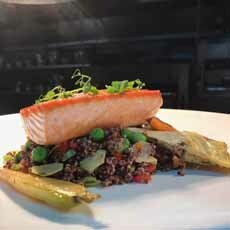 Salmon on a bed of grains (here, red quinoa) with baby carrots, green peas and baby artichokes, topped with pea shoots (it’s fresh pea season) (photo courtesy Charlie Palmer Steak). Pulses refer specifically to the dried seed of legumes. Examples are dried beans (including chickpeas), lentils, split peas and other dried peas. Both legumes and pulses are very nutritious: low in fat, high in fiber, cholesterol-free and high in folate, iron, magnesium and potassium. They’re also a good source of protein and can be a fat- and cholesterol-free substitute for meat. A carbon dioxide cartridge in the back of the appliance carbonates creates a bottle of sparkling water. There are colors for every decor. A four-pack of the most popular flavors. First you carbonate the bottle of water (photo above; then you add your flavor. Fizzy cocktails, anyone? 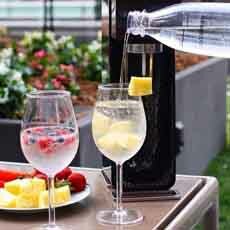 Make a sparkling Bellini, G&T, Margarita or wine spritzer (all photos courtesy SodaStream). 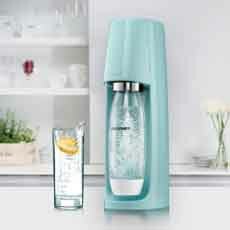 If you drink a fair amount of sparkling water or soda, there’s one item you should have in your kitchen: SodaStream. We love SodaStream, the at-home sparkling water maker. It’s the best way to reduce plastic and metal waste by eliminating the need to buy plastic bottles or cans of sparkling water and soda. It also saves you gas and muscle fatigue from carrying heavy bags of soft drinks, not to mention disposing of the empties, if you do your best to recycle. It encourages the family to drink more water: sparkling, plain or with flavors. It requires no electricity, no battery. It’s lightweight and portable (bring it onto the patio, a boat, etc.). The carbon dioxide cartridge that provides the fizz is returned for a credit when you purchase refills at SodaStream retailers. In addition to the company website, SodaStream is sold at Bed Bath & Beyond, Staples, Williams-Sonoma and other retailers. Here’s a store locator. 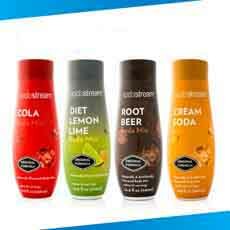 Many people use SodaStream to make sparkling water. But just add flavor to the bottle, and it’s easy to offer everyone the soda of their choice. We have six different flavors on in our pantry: cola, diet cola, ginger ale, lemon-lime, root beer and Diet Dr. Pete (like Dr. Pepper). There are almost 50 flavor choices: something for everyone including cucumber water, energy drinks, coconut water, peach iced tea, cocktail makers (BYOB), even Welch’s grape juice. We keep three ready-to-drink flavors in the fridge at any time, and can make something a guest requests in a minute. Just keep extra bottles of cold water in the fridge, and you’re ready to insert one into the SodaStream maker, carbonate in seconds and add flavor. Every family making soft drinks in SodaStream’s reusable bottle can reduce more than 3,700 bottles and cans from the planet. That’s an impressive statistic—and it’s Earth Month. How can you resist a purchase that helps you save our planet? In addition to sitewide savings, you can take an EXTRA 15% discount with promo code EARTHDAY, through April 27th. AND REMEMBER MOTHER’S DAY AND FATHER’S DAY: COMING SOON! Passover macaroons are a traditional treat for Passover. But what if you don’t like coconut—or simply have a yen for chocolate? Voilà: a Passover-friendly recipe for brownies, thanks to Melissa’s. In order to “bulk up” the brownies in the absence of leavening, Melissa’s has added dried cranberries. They’re delicious paired with chocolate, but you can substitute nuts if you prefer. 1. PREHEAT the oven to 400°F. Grease a 7-1/2 x 11 x 2-inch baking pan. 2. MELT the butter and 1/4 cup sugar in a medium saucepan over low heat. Stir to dissolve the sugar. Add the chocolate and stir until melted. Remove from the heat and set aside and cool to room temperature. 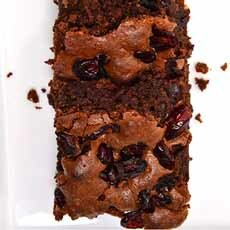 Passover brownies studded with cranberries (photo courtesy Melissa’s). 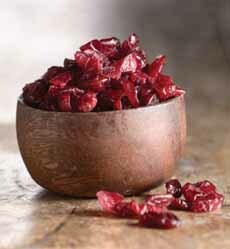 Dried cranberries (photo courtesy King Arthur Flour). 3. BEAT 2 eggs in a small bowl until thick and pale yellow (4 minutes). Add the vanilla, cinnamon and cake meal. Whisk into the chocolate mixture. 4. BEAT the remaining 2 eggs with an electric mixer until stiff peaks form, slowly adding the salt and remaining sugar. Add the cranberries and fold into the chocolate batter. Mix thoroughly by hand. 5. POUR into the prepared pan and bake until top is crusty, about 20 minutes. Allow to cool, then cut into slices as desired.